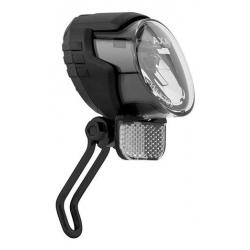 The AXA Luxx 70 has a fantastic 70 lux light output with a standlight facility. When you stop cycling, the light continues to shine for up to 4 minutes. Manual switch or automatic on-off mode for hub dynamos (light can also be used with bottle dynamos). Primarily intended for use with a hub dynamo, however this light is compatible with all the dynamos that we sell. Can be combined with any of the rear dynamo lights that we sell so you can make a system around this light which fits your budget and your bicycle. Read our blog post about choosing dynamo lighting system components. The manufacturer includes cable to reach to the dynamo and also to reach a rear light.